Posted by alwaysjan in Life. There were cockroaches everywhere. A biblical plague had descended on the Holy Land – the Holy Land being our overpriced New York City apartment. (Yes, I realize that using the word “holy” in the same sentence as “New York City” amounts to blasphemy.) 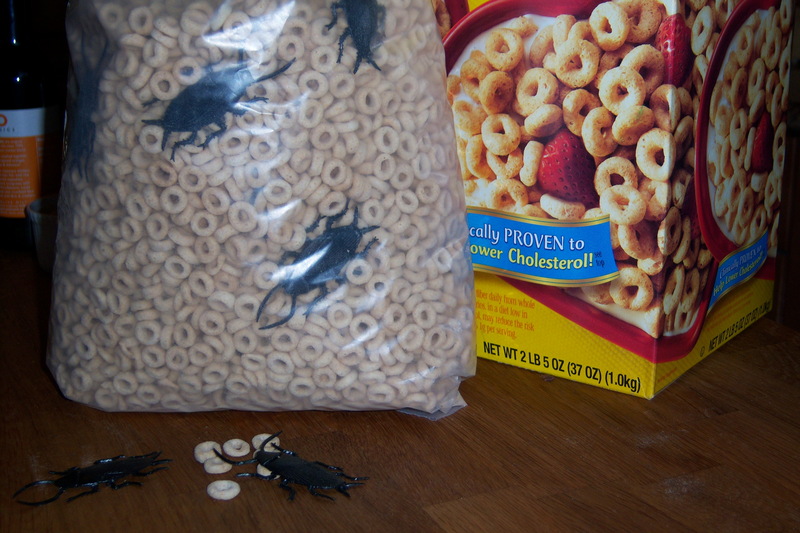 The final straw came when we found them crawling in the cereal that my sons ate. Cereal killers! Drastic times call for drastic measures. We decided it was time to call in the professionals. Who you gonna call? – (No, not them) – Lady Killers! I can’t remember how I found out about Lady Killers, but the woman on the phone assured me she could take care of “the problem.” I envisioned a highly-trained entomological exorcist who could banish these six-legged demons that had turned our lives into a living hell. We’d exhausted the traditional “final solutions.” We’d already sprinkled crop circles of boric acid around the apartment, and all of the Roach Motels had vacancy signs. We’d taken to wiping down the kitchen counter hourly and keeping all food in tightly sealed plastic containers. It was like we were living in a bomb shelter and dipping into rations when we ate. I eagerly awaited the arrival of the Lady Killer. So I was a bit taken aback when a dowdy, overweight woman arrived and introduced herself as Elaine. This was the Lady Killer? She had an unusually firm handshake. That’s when I realized the Lady Killers were not just ladies, they were lesbians. Talk about a niche market. As Elaine regaled us with tales of the German Brown cockroach’s superpowers, I couldn’t help but be reminded of the crusty old shark hunter Robert Shaw played in Jaws. All she was missing was the bite out of her forearm. She informed us a cockroach could live off a single drop of grease in the air for a year. And just like those starving Russians during the Siege of Leningrad, cockroaches could survive by eating the glue from book bindings. We had an entire wall of books, which I now realized was a virtual Hometown Buffet. From her purse, Elaine produced several unmarked plastic squeeze bottles containing a mysterious white powder. Boric acid? “No,” she scoffed. She informed us that eating boric acid only made THEM stronger. To be honest, I was afraid to ask her what was in the bottles. Although Elaine assured us it was non-toxic to humans, where was the label? This was obviously some home brewed concoction. But we were desperate. Sometimes it’s best not to know. For the next two hours, Elaine ransacked our apartment squirting the white powder into every nook and cranny. The entire time, we raptly listened as she detailed the down and dirty habits of the German army that had been occupying our apartment and holding us hostage. She informed us the reason THEY were inside the kitchen clock is that they liked the warmth, and it provided an excellent base camp to launch their expeditions. If I’m ever a contestant on Jeopardy, I can only hope that one of the categories is Cockroaches. I’ll take Cockroaches for $500 please! We wrote out a check for a couple of hundred dollars and waited. Elaine had said it would take a week before we’d see results. My husband was convinced the white powder was plain old boric acid and the “wait a week” ploy was just to give Elaine time to cash the check. He of little faith. After a week, THEY began dying. Within two weeks our apartment was roach-free (knock on wood!). The down side was that every time we opened a file cabinet or drawer, a plume of white powder would rise up, leaving traces of white powder on our face and hair. This was New York City in the 80s, so I’m sure our neighbors just thought we had a serious cocaine problem. Any New Yorker can tell you that’s not nearly as bad as a serious roach problem. We didn’t see a cockroach for six blissful months. Six months may not seem like a long time. But after eight years of daily hand-to-hand combat, this was a dream come true vacation. I actually began to relax. We still kept all of the food in plastic containers; but I no longer swatted anything that moved in my peripheral vision, including my children. After six months, the clock struck midnight and the spell was broken. The roaches began straggling back. So Elaine returned once again with the magic powder. By then, she knew the most intimate details of our lives – as she’d been through every drawer and cabinet in our apartment. By the time we finally decided to leave New York City, the cockroaches were back in full force. If I had any second thoughts about our flight from the Holy Land, these were put to rest when I saw baby roaches crawling inside the digital display on the microwave oven. Gross! We waved the white surrender flag and were escorted safely out of the combat zone aka New York City. We were excited to be moving to Mexico. Little did we know that a welcoming committee was already forming to greet us – of scorpions. Im sooo greatful to live in england where we dont usually have serious insect problems. One day a year the flying ants appear in their droves but otherwise there are not too many insects in the house at all, and im quite happy to have resident spiders, they are after all, natures fly trappers ! As one who has endured a plague of cockroaches (in a very quaint pre-Civil War house in Lawrence, Kansas!) I could relate to the absolute horror of living with cockroaches, even though it was only for a short time. Desperate times require desperate measures. I wish I would have had my own Lady Killer. What was that white powder????????? And any post that references Jeopardy is exquisite! If I knew what the magic white powder was, I wouldn’t still have my day job. I like to imagine that it was meth and Elaine later moved west and set up a lab in a trailer in Palmdale. I’m really interested to find out more about your encounters with cockroaches. I’m looking for case studies to feature on a series for Animal Planet and am keen to bust the myths around cockroaches and prove that it can be a problem for ANYONE. Do let me know if you are happy to speak with me. can i take a guess about the white powder? i am willing to put money on diatomaceous earth, i live in texas and battle roaches and scorpions, it’s non-toxic and effective against many insects. I live in NYC Brooklyn in a apartment like you did and I’m disgusted by the amount of roaches I see. No matter how much we clean they always appear. NYC rent is too high for us to have these problems 😁.